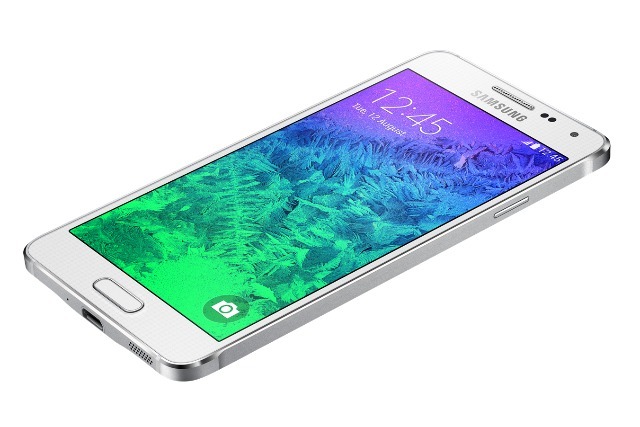 Samsung has just released the Galaxy Alpha smartphone, touting a design refresh that signals it wants to become as desirable as Apple. Samsung has launched the latest in its arsenal of Galaxy smartphones, this time the mid-range Alpha. With a low-key launch and zero fanfare compared, say, to the flagship Galaxy S5, the Alpha might slip under the radar were it not for one thing – it looks more like the iPhone than any other Samsung phone to date. The main difference between the Alpha and the rest of the Galaxy range is its polished metal frame, an important trade-up from Samsung’s usual plastic. Samsung’s also unusually opted for a smaller screen and lighter, slimmer, body – again a hallmark of the iPhone. The company described the phone as a "fresh design approach", though it’s worth noting that the phone’s mediocre specs put it in the mid-range rather than the high-end category. The phone is due to arrive in September, just ahead of the expected release of the iPhone 6. That the Alpha features a more premium finish but middling specs is a good illustration of Samsung’s dilemma, according to analysts. Which is more important – creating a desirable phone, or creating a cheaper alternative to Apple? Up until now, Samsung has put price over design and quality, casing its phones in plastic to keep manufacturing costs down, and passing those savings onto the consumer. That includes its flagship smartphone, the Galaxy S5, which arrived early this year and was intended as an early challenger to the upcoming iPhone 6 – expected to feature an all-metal body and a sapphire-based screen. But all of Samsung’s competitors in the high-end smartphone market – Apple, Sony, HTC – have produced devices with more expensive materials and less plastic, resulting in a better finish. The result is that Samsung’s devices are praised for their comparative good value but seen as lacking polish. "Samsung needs that strategy of a lower price, because it hasn’t been able to grow its market strongly enough to become a desirable brand," said IDC analyst Francisco Jeronimo. "Consumers buy Samsung’s products because they are less expensive than Apple’s - Apple fans really love their products." If beating Apple on price was Samsung’s sole aim, then building plasticky devices isn’t necessarily an issue. But now that HTC and Sony are trying to produce beautiful, high-end phones, Samsung will need to keep up with the competition. "Samsung is missing an important opportunity to improve the quality of its materials," said Jeronimo. "I say this because [it doesn’t design] a fully metal body – it prefers to keep the back covers made of plastic." Jeronimo noted that this is an "important time" for Samsung, which saw smartphone sales fall in the second quarter while the rest of the market grew. "I tried the Alpha a few weeks ago," he added. "The device is good, don’t get me wrong. It’s thinner, it’s quite light, but you don’t have the same premium feeling as holding an iPhone."